Hillary Clinton has officially announced she’s running for US presidency in 2016. This was all handled rather well online, with a high-production value video, a quick change of all of her social accounts, and the launch of a new campaign site. Alongside the positives, there were however a few mistakes. None of these were ‘campaign ruining’, but some were surprising tech blunders for such a high profile launch, and some meant they both missed out on potential early traffic to the campaign website and made a few of their bigger supporters look a little foolish. 1. There are some nice little tech touches on the site. As a few other tech notes: The site uses a mixture of technologies, sat on Microsoft IIS, with Varnish caching, Amazon server infrastructure, ‘Signal’ (formerly brighttag) for connecting data, both Google Analytics & Yahoo Analytics, and various other tech. Unlike the Obama campaigns, there are no big visible signs of A/B testing (though that doesn’t necessarily mean they’re not doing it), and unlike many campaigns today they don’t seem to be using an off-the-shelf campaign package like NationBuilder. There are a few bits of advertising technology on the site, but not a massive amount for a campaign, and certainly nowhere near the scale a big publisher would use. In other words: All seems solid but not massively sophisticated. From the outside it doesn’t even feel as sophisticated as the Obama 2008 campaign from a tech point of view, though it’s early days & I could be severely misjudging it. 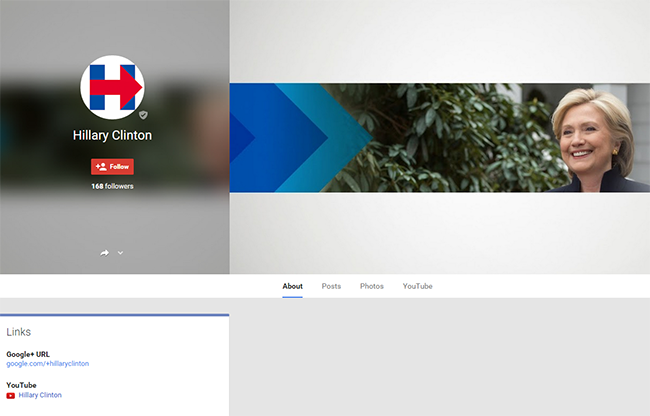 Within minutes of the announcement, Hillary’s Twitter & Facebook accounts had been updated to reflect she’s now officially running for president. 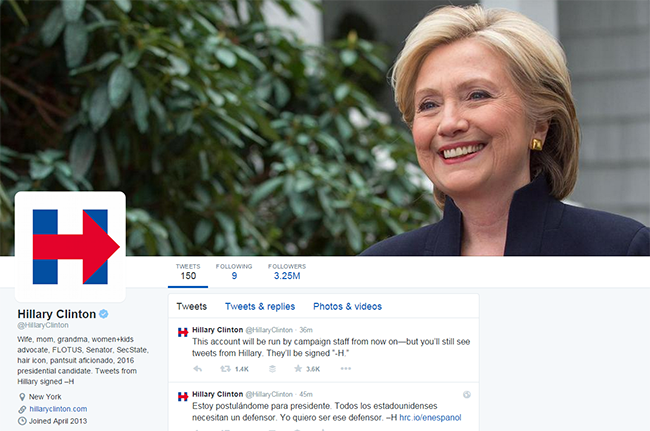 The logo was updated, a tweet went out announcing her running, and the old ‘frowning in sunglasses on the phone’ header image was replaced by a smiling, screengrab-friendly shot of Hillary. Not the end of the world, but still unfixed after a couple of hours, and after many hundreds of these erroneous shares. I’d say that’s more a statement about the perceived importance of Google+ (very low) than about her digital campaign proficiency. It doesn’t rank within youtube when searching for ‘Hillary Clinton 2016’ or any related terms (ironically, other networks have copied the video & given it a better title, meaning theirs do rank). From a theoretical point of view it’s less likely to receive clicks from search results. 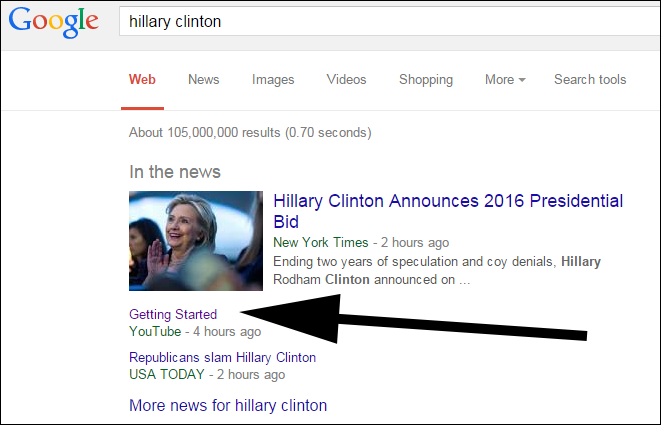 “Getting Started” is far less clickworthy than something like “Getting Started – Official Hillary for America Campaign Launch” for example. 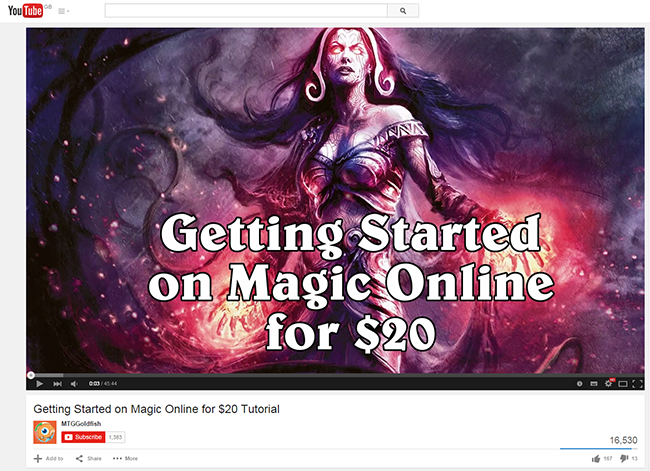 Not a massive issue, and it will work itself out over time, but I’m sure her campaign team would prefer potential donors to see another Hillary video, rather than “Getting Started on Magic Online for $20”. In other words it indicates again a possible lack of attention to detail, or a gap in digital knowledge. What won’t have much of a negative impact, but is surprising based on the amount of attention these types of things usually get. Someone eventually noticed this, and it was fixed around 2.5 hours after the site launched, but this & the odd social blunders are quite surprising for a campaign that is likely to cost hundreds of millions of dollars (a ‘Ready for Hillary’ adviser suggested it could be well over a billion). That’s not the end of the world – Google does its usual good job of showing results for the phrase ‘hillary clinton’ if mistyped, but anyone visiting www.hilaryclinton.com will find themselves at a dead end, and any of the 24,187 people who follow only the fake @hilaryclinton on Twitter will miss out on genuine updates. As a side-note, there is of course the minor risk there that the account starts tweeting again & causes embarrassment. 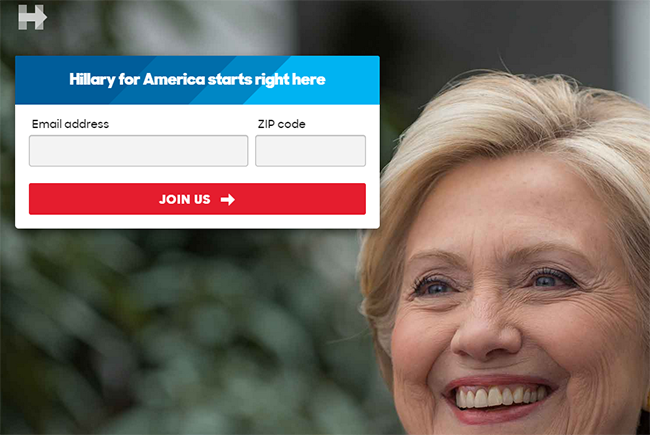 Again, these are relatively minor issues, but it should not be a difficult job to buy the typo domain hilaryclinton.com from its current owner, and to claim the impersonating twitter account. Alongside the oddities mentioned above, there are various parts of the site that simply aren’t finished. Naturally they’ll extend the site over time, but there are things that are actively broken at the moment. It doesn’t seem fully finished – there’s no lead-in text at all, and if you submit a half-finished application there are no error messages, or confirmation messages. (and the only field marked mandatory is ‘Last Name’). 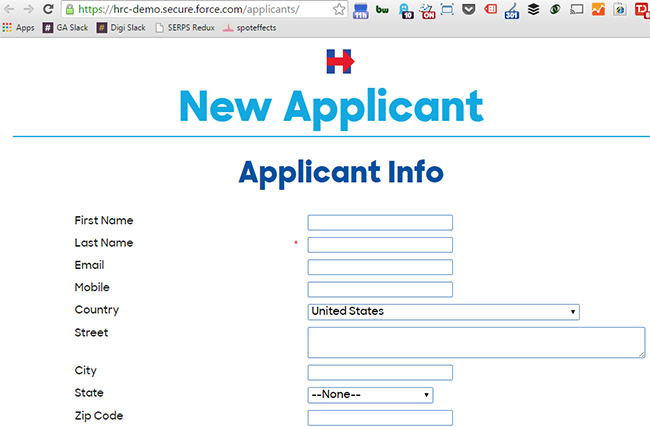 If you look carefully, you can see the URL there is ‘hrc-demo.secure.force.com’. Hopefully they are correctly storing data submitted, but the inclusion of the word ‘demo’ there indicates that was not supposed to be the live version. Aside from the 2 examples above there are various other elements that simply appear to be missing from the site, but I won’t labour the point. Hillary Clinton’s 2016 campaign launch was nicely done from a digital point of view, with a smooth flipover of the social accounts & some very nice messaging from a communications point of view. There were however some very odd technical, social, and SEO misses. With every site launch, and every campaign launch, some errors occur. In this case none are campaign-threatening in any way, but, they’re very surprising as some are so basic, the campaign is so massively high profile, the site itself is simple enough to make checking easy, and the team will be very aware – from the messy healthcare.gov launch in 2013 – of the reputational damage that can be caused by tech glitches. Do leave a comment if you have anything to add, or think any of the above is unfair. And do share this post if you think others would find it useful. Great blog as always Dan and some nice observations. It’s interesting that there are several SEO basics missed, probably due to a rush to get a campaign site live to a deadline but as you say, still odd to not get this right. The redirects for non-main version of the site aren’t 100% covered e.g. trailing backslashes don’t redirect and some are 302 instead of 301. Climb Online: Performance After 100 Days Who would win an election today: Jeremy Corbyn or David Cameron?